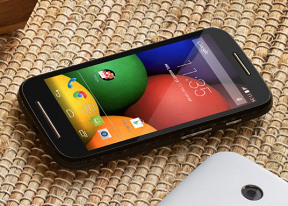 Motorola Moto E runs pure Android 4.4.2 KitKat out of the box. Motorola has started seeding the 4.4.3 bug fix update in early June, so it should be available everywhere by the time you are reading this. Motorola does not provide any custom additions to the vanilla Android, which is one of the reasons the Moto lineup is treated with Nexus-fast Android updates. The lockscreen is the usual affair - it supports widgets (one per pane), plus there is a shortcut to the camera at the bottom courtesy of Android KitKat. There are a few available default widgets, but you can always get more from the Play Store. The Moto E allows for five homescreen panes. You can't change their arrangement nor can you add or remove panes. Adding stuff on the homescreen is easy, as is customizing it. You can set various live and static wallpapers, add widgets and shortcuts. The notification center is the usual stock Android one and Quick toggles are available via a shortcut to the right. You can get straight to these by with a two-finger swipe from the top of the screen. From there you get access to key device settings such as brightness, Wi-Fi, Bluetooth, location, mobile networks and Battery. Some toggles are directly accessible shortcuts to their respected functions in the settings menu. The app drawer is laid out across multiple side-scrollable panes. The apps are sorted alphabetically followed by the available widgets. Moto E doesn't support custom sorting for the app drawer, nor is there an option to remove the widgets panes, which come right after the app ones.